First came the cup and ball trick, which astounded the ancient world. Then the Indian rope trick had people disappearing into thin air. Now magicians can fly over the Grand Canyon and freeze themselves alive in blocks of ice. Prepare to be amazed as you witness the secrets of some of the world’s greatest magicians! From extreme escapology and loopy levitation to mysterious mind-reading, find out how they do it. Learn how to join the Magic Circle, how to saw your best friend in half … and why a horse was once the world’s top trickster. And get the pukka props and perfect patter to put on your own prize performance! magic that actual can go wrong lol!!!!!! I LOVE this book – its so interesting and full of facts and magic! 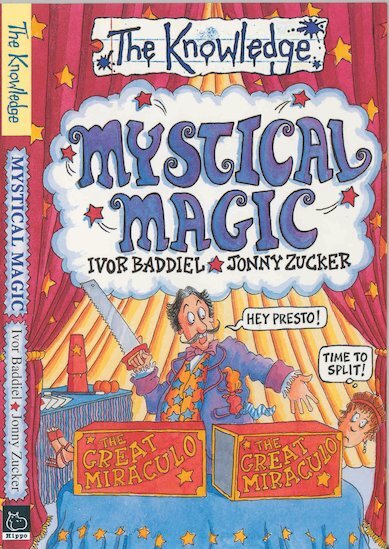 It tells you about magic tricks, magic tricks and how they do them!